LAS VEGAS, NV -- The WHSL recently wrapped-up their 18th Western States Shootout and it wouldn’t be much of a hyperbole to say this was the best one yet. 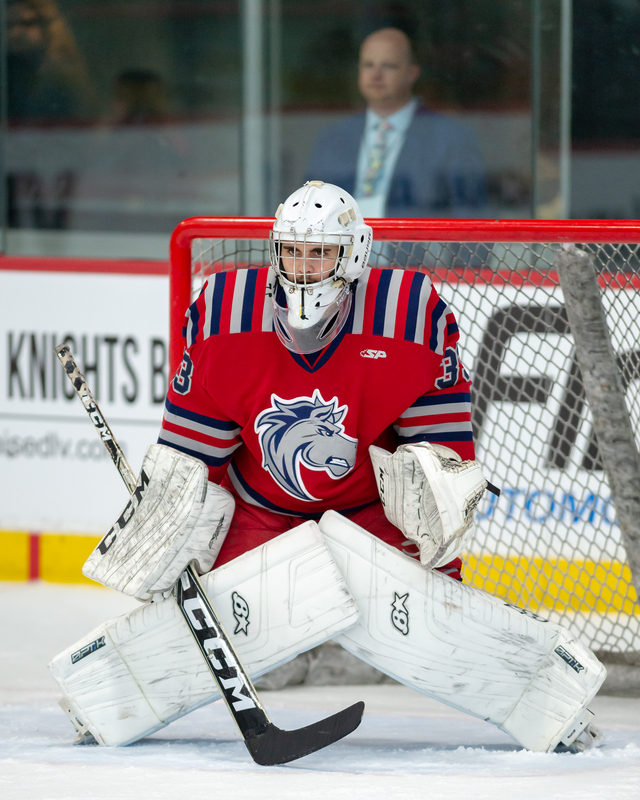 Over the span of four days, all 23 WSHL teams and two all-star teams from the Canadian Premier Junior Hockey League (CPJHL) played in front of hundreds of fans as well as over 120 college coaches from NCAA Division I, Division III, and ACHA programs. Those in attendance were greeted with highly-competitive games from start to finish, an achievement in and of itself, but one sought by WSHL officials when the schedule is made. When scheduling the 38 Western States Shootout games, White considers divisional standings as well as that year’s composite schedule to give each team three quality opponents over the four days. That philosophy was seen throughout the week of games, but was fully evident during the early afternoon session at City National Arena on Wednesday, December 19thas division leaders, Ogden Mustangs and El Paso Rhinos, squared-off. The Mustangs entered the Western States Shootout with a 23-1-0-1 record, the best mark in the WSHL, and were coming off a 3-0 shutout of the Fresno Monsters the day before. The Rhinos are the defending Thorne Cup champions and came in leading the Midwest Division with a 18-5-2-2 mark. The Rhinos also played one of the most thrilling games of the first day, turning a 4-1 deficit with 22 minutes to play into an 8-4 victory after scoring seven goals in just about 18 minutes. Needless to say, both teams wanted the victory to jumpstart their second half of the season. It was the only game going on at City National Arena at the time and not only were there a couple hundred fans in the seats, but nearly every college coach in attendance, around 125 this year, lined the boards and the upper level of the stands to watch the two teams play. The action was fast, physical, and end-to-end, exactly the type of play the WSHL wants to put on display for each of the showcase games. The way the WSHL administration sees it, the more competitive the games, the more the players can display their talents. The goal is for each and every one of the players on the ice to play collegiately over the next few years. Fortunately for the players in the WSHL, that is becoming more and more of a reality thanks to the overall improvement of the league and the growth of the showcase. This year, the WSHL welcomed college coaches from all over the country to Las Vegas, each trying to find players to fill out their teams in the coming seasons. That number has grown exponentially over the years allowing for more and more players to get looks at NCAA Division I and III schools. White credits a number of things for the growth in attendance, but he knows it starts with the timing and location of the event. The Western States Shootout used to be held at a variable predetermined location each October. But White and the WSHL Board of Directors found that college coaches weren’t attending their showcase, opting instead to go to ones held by other leagues closer to campus or full of top-tier players. White, to avoid competition with other leagues, decided to reschedule the showcase to December and feature it at one set location that did not change year-over-year. That location became Las Vegas. The WSHL has been in Las Vegas for over a decade now, and has grown from 30 mainly ACHA coaches to over 120 mixed NCAA and ACHA coaches. As a college coach, you can’t ask for much more for a league showcase. After months going between practices and games in cold-weather environments, coaches have an opportunity to escape to Las Vegas for four days to do some holiday recruiting. It’s a relatively slow time for Las Vegas tourism so flights to “Sin City” are not nearly as expensive as other times of the year. Additionally, the WSHL provides transportation to and from the rink and offers three meals a day for coaches. Add in the hotel deal worked out with the Stratosphere by the league, which gives discounted rates on rooms and food at various hotel restaurants, the four-day event doesn’t cut into the budget nearly as much as other recruiting trips could. The Western States Shootout is nearing its 15th year in Las Vegas and all signs point up when you speak to people involved in the event. The showcase is now held in two great facilities, City National Arena and the SoBe Ice Arena. Two-year old City National Arena, the headquarters and practice facility of the Vegas Golden Knights, boasts two sheets of ice both with bleachers for seating and a bar/restaurant that overlooks both rinks. The Stratosphere, which has served as the official showcase hotel for a decade, is undergoing extensive (and expensive) renovations, meaning this time next year, each guest will be welcomed by new rooms and additional dining and leisure options at the hotel. Plus, let’s be honest, hockey is booming in Las Vegas. The Golden Knights took the city by storm during their run to the Stanley Cup Finals last year and the number of children involved in youth hockey in the area is large and growing. A number of the kids who came through City National Arena for their skating classes over the course of the showcase leaned up against the outside windows of each rink to catch a peak of the action. They’re the future of hockey and the beauty of this showcase is that they get to see what is possible for them down the line. They get to see that there are teams within their area to play for which will help them advance to the next level and beyond. The WSHL has had franchises in Las Vegas at multiple points throughout its history and expects to have one in the not too distant future. The league is the best it has ever been and doesn’t see the level of play dropping any time soon. Oh, and that Ogden-El Paso game from day two that pitted two of the league’s top teams against each other? It couldn’t have displayed that belief any better. El Paso raced out to a 2-0 lead in the first half (the showcase games are played with two, 25-minute halves instead of three, 20-minute periods) with goals from Jonas Burman and Samuel Sykes. But Ogden potted a penalty shot with under 10 to play in the first half which helped spark a two-goal rally to make it a 2-2 game at halftime. The Rhinos retook the lead with an early second-half goal, but Ogden’s Ammon Anderson’s second goal of the game made it 3-3 with 18 minutes to play. A second penalty shot successfully executed by the Mustangs gave Ogden the lead for good as they netted a shorthanded, empty net goal to seal a 5-3 victory, wrapping up both teams’ second day at the showcase. Ogden finished the showcase 3-0, securing an 8-2 victory over Edson on Thursday before heading home. El Paso rebounded by shutting-out fellow division leader Bellingham Blazers, 4-0, bringing their showcase record to 2-1. Those two could most definitely meet again down the line in the Thorne Cup Playoffs, but there will be several challengers looking to keep that from happening, each, for the most part, showing what they’re capable of during the showcase. Western Division leader Long Beach Bombers played three of the most exciting games during the Western States Shootout. They topped Edson, 4-3, negating a hat trick from the Aeros’ Emil Johansson on Wednesday. Then the Bombers overcame two separate one-goal deficits to beat the Northern Colorado Eagles, 6-3. That game was much closer than the score reflects as the Bombers potted two, empty-net goals in the final 2:17 to pull away late. Then, on the final day of the showcase, Long Beach held off a furious attempted rally from the Oklahoma City Blazers, who had all 22 second-half shots stopped by Domenic Bosetti, in a 2-1 win. Bellingham got swept in the showcase, but can breathe easy knowing that it still maintains a 17-point lead over second place Seattle Totems in the Northwest Division. And that Oklahoma City team that battled Long Beach on the final day of the showcase will certainly be in the mix as well. They trail El Paso in the Mid-Western Division standings by four points following the showcase, 66 to 62, but have played four fewer games than the Rhinos at this point of the season. The second half of the WSHL season kicks-off on January 3rd. Teams will have nearly three months until the start of the 2019 Thorne Cup Playoffs, which will culminate with the finals being held in Ogden, UT.